Trapped in the Happy Hallow Insane asylum by thousands of the dead, Steve, Heather, Tick-Tock and the rest of the group search for a way out. With tens of thousands of reanimated corpses also coming towards them, time is running short as they plan a way to get Cindy, a ten-year old girl that is immune from the HWNW virus, to safety. She is their only hope for finding a cure to the disease that reanimates the dead into beings that are compelled to eat ravenously and crave human flesh, and she must be saved at all cost. When what is left of the dead weight that the group rescued from the Battleship Texas realize that it is a life and death struggle, they join in to fight for the group’s survival. But will it be enough? With a deadly landscape to cross, they will need help. Bandits scour the country as they search for food, fuel and firearms to stay alive, and the military is breaking down. After receiving numerous rejections from the mainstream publishing companies, an agent suggested I self-publish and switch from writing about serious subjects such as illegal immigration and the Gaza strip to horror instead. He assured me that this genre would at the very least get my name established. I have always loved the zombie moves put out by George Romero so I decided to go in that direction. What started out as one book quickly evolved into a four book series though, and now Dead Calm, Dead Weight, and the final book, Dead End of The Dead Series, are out. I actually base them on people that I have met in real life. I use their traits and characteristics in a fictional setting. 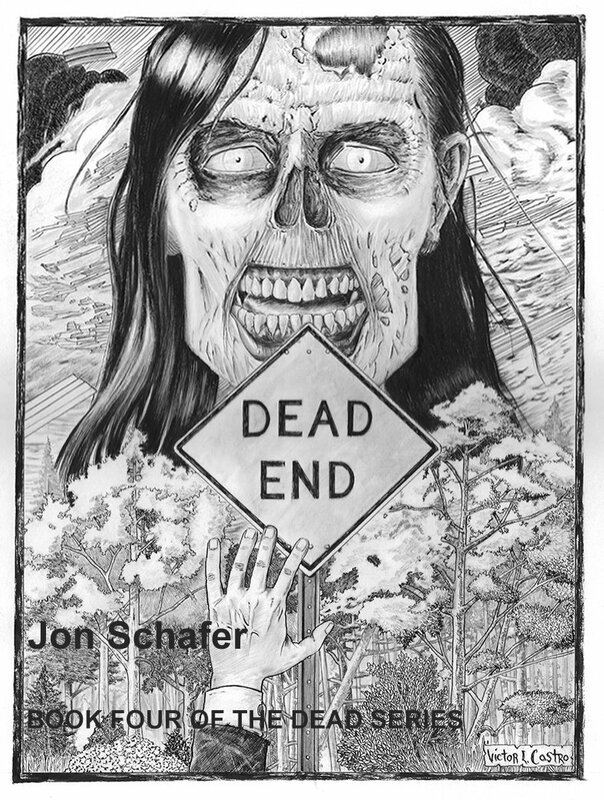 Jon Schafer (One of the top horror authors on Amazon) is an artist, a writer and used to design amusement parks, casinos and family entertainment centers as well as owning his own architectural design firm. He loves to write and has traveled around the world so he uses a lot of his life’s experience in the background of his books. He served in the Marine Corps and, while he would never do it again in a million years, cherishes every minute and memory of that time. His first book, Dead Air, is number one of a four book Zombie apocalypse series, with book two, Dead Calm, book three, Dead Weight, and book four, Dead End, the final book of The Dead Series, on sale. His other book, Immigrant Song, takes a hard look at illegal immigration but with a twist. All his books are Indie written, edited, promoted and produced. When you finish one of his books, please rate and review it. He relies on his readers to tell him how they liked his work and doesn’t have family and friends flesh out his reviews.